YSATT was instrumental in establishing a Customs and Immigration presence in Chaguaramas. At a higher level, with the help of the Comptroller of Customs and the Chief Immigration Officer, YSATT has been instrumental in getting our laws adapted to the needs of the yacht service industry. 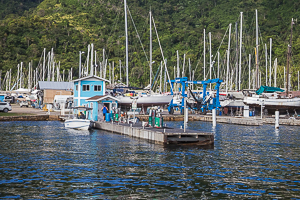 YSATT lobbied keenly for the introduction of rules that allow cruisers to bring boat parts and related repair materials into Trinidad and Tobago, free of duty and VAT. We are working towards taking this to the next level with the introduction of a bonded warehouse and a single harmonised Immigration clearance form. The production and distribution of an industry brochure development and placement of a print advertisement in regional and international marine media having a presence at several international events. Developing and implementing an annual survey to collect data on the yachting industry educating the general public about the yachting industry to mitigate the negative perceptions about the industry. We assist cruisers in the event of an oil spill, distributing solvent free of charge, and in the case of the oil spill of September 2000, we coordinated the cruisers’ claims for compensation. We established a Marine Environment Fund to address several environmental issues, e.g. the creation of an oil spill response strategy. We work closely with the oil companies based in Chaguaramas to ensure that their operations do not negatively impact on the industry. We offer advice to all our members on environmental matters. We coordinate an Annual Clean Up Day, which is held on the third Saturday in September to coincide with the Ocean Conservancy’s International Coastal Clean Up Day. YSATT was instrumental in having the anchorage area designated to help control traffic flow and ensure the safety of those at anchor. Moorings are being placed to ensure that boats are safe in the anchorage.